I could really be the poster girl for Roanoke–I love this place that much. Every time I go to a potluck or a party or a gathering of some sorts (and especially if I’ve had a glass of wine or two), I inevitably start gushing about how amazing the city is, how wonderful and friendly all the people are, and how many community-oriented food and bicycle opportunities there are here. The old-timers, folks who were born here or have lived here for far too long without leaving and then coming back to see how great it is (see, I’m biased…), mostly roll their eyes at me and say, just live here awhile, you might not feel the same way. I doubt it. As for the food, well, my car still hasn’t passed inspection (cracked muffler, apparently), and I’ve no money, so my only option was to come home and make cookies. I am my mother’s daughter. When Baking Bites posted a recipe for Sweet Potato Oatmeal Chocolate Chip Cookies, I knew I had to make them. 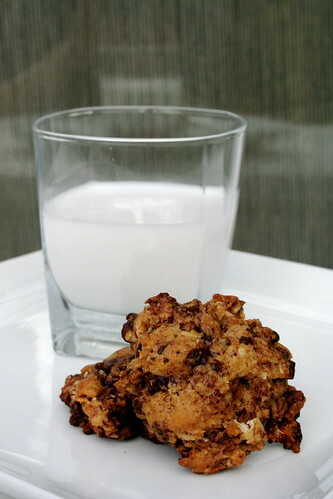 The recipe essentially mirrors the Pumpkin Chocolate Chip Oatmeal (Crack) Cookies of 2008, so I figured it had to be good. Verdict? Hell yes they’re good! While I made up a tin’s worth for our Classic Horror Film movie night, I definitely saved some dough and have been baking up two or three a day for the past few days. And with sweet potato in them, they’re healthy, right? To make the sweet potato puree, peel and chop 1 medium-sized sweet potato into 1/2″ dice. Bring a pot of water to a boil on the stove. Add the sweet potato to the water and boil for 7-10 minutes until soft when poked with a fork. Remove from heat, drain water, and mash with the fork. In the bowl of a stand mixer or with a hand held mixer, cream the sugars and Earth Balance until fluffy. Add the soy yogurt sweet potato puree, and vanilla, mix to combine. Add the spices, salt, baking powder, and baking soda and mix to combine. Slowly pour in the flour and mix until a dough forms. Add the oats, chocolate pieces, and pecans and mix just long enough to combine. Drop tablespoonfuls of the dough onto the prepared baking sheet. Flatten slightly with the palm of your hand. Bake for 12-15 min, until cookies are set. Let cool on sheet for 3 or 4 minutes, then transfer to a wire rack to cool completely (or, if you’re like me, eat them all in one sitting). Looks like a fun place! And I love that cookie recipe. This post put such a huge happy smile on my face! It is awesome that you found a city you love so much, it really does sound like a great place! 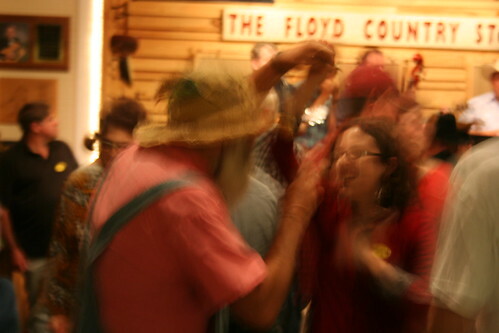 And I want to go to a big Appalachian style dance party like that and rock the house with a groovy dude in a beard! What fun! And what cookies!!!! Those look intensely beautiful, and what a gorgeous combination of flavors. Those look good! I never tried sweet potato in a cookie before. Those sounds like they’d be perfect for Thanksgiving with the sweet potato, spices, and pecans. I like the recipes over at Baking Bites, there are some really good recipes. hoooooray for so much fun! i love virginia so much – and i’m glad you love roanoke, Jes! it’s full of so much awesome. you look like you had a blast dancing & learning a few new steps at the jamboree. w00t! sorry about the cracked muffler & lack ‘o funds – but the sweet potato chocolate chunk oatmeal pecan cookies look scrumptrulescent! i do remember those pumpkin chocolate chip oatmeal cookies from last year – and i’m totally gonna see if i can make these cookies gluten-free. sweet potato totally makes them good for you – especially since they’ve got oats in there, too! ah ha ha! mmmmmmmmmmmmmm! Oh, I’m totally sold on these babies! I’ve made my fair share of pumpkin cookies, but never sweet potato. Great idea! Sounds like Roanoke’s a lot more fun than Northern Virginia! The cookies look fabulous; I love the sweet potato idea. I love the picture of you dancing with beard man – good for you! And those cookies look so delicious. Hehee… you look totally pro in that action shot vegan sister! NICE! Next time get a still shot so we can be in full reverence of the beard though. ooh.. i love making big batches of cookie dough and cooking them up for nights on end!! !